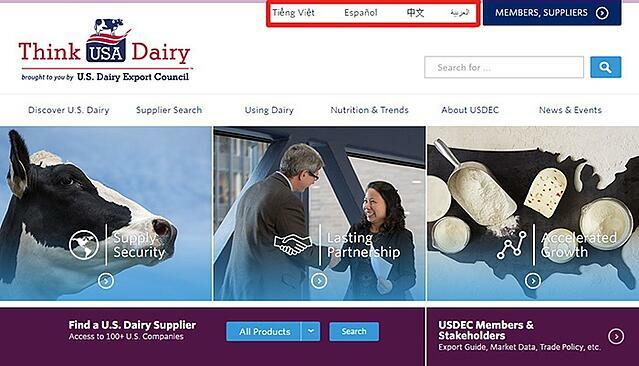 USDEC’s website ThinkUSAdairy.org is now accessible in four additional languages: Arabic, Chinese, Spanish, and Vietnamese (accessed from the ThinkUSAdairy homepage). These international language sites offer extensive resources similar to their English counterpart, opening up a breadth of knowledge and tools to new audiences around the globe, including in China, Vietnam, Latin America and the Middle East. Key sections of ThinkUSAdairy.org have been translated and localized to allow the most seamless web experience for overseas audiences to learn about U.S. Dairy. Additionally, translated versions of informational tools such as the suite of U.S. dairy brochures are also available from these new sites, offering concise overviews in multiple languages of the wide array of dairy products, ingredients, and resources the U.S. dairy industry has to offer the world. Each site also highlights past and upcoming USDEC events and activities overseas organized in partnership with our international offices. Dairy ingredients are a key asset in developing the next generation of new products that deliver the nutrition, taste and functionality to meet consumer expectations. U.S. dairy suppliers’ offer these diverse products and services in key markets globally. Both the U.S. dairy industry and USDEC are dedicated to providing the best experience to our consumers, customers, and buyers in the global dairy market, despite location or language barrier, and will continue to expand the availability of our online resources to serve and reach new audiences.